A world clock displays the times for many different places around the world. The concept of a world clock is a moving circular map of the world moves inside a stationary 24 hour diagram. This activity can be a great tie in with geography as well as science. NOTE: If using cardboard, it may be easier to have the two pieces pre-cut for each student, depending on grade level. 1. 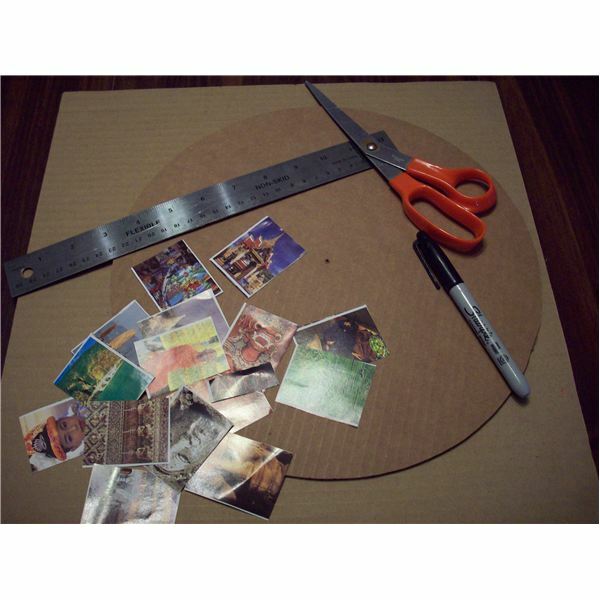 Cut one piece of poster board or cardboard into a 15 inch by 15 inch (75 cm x 75 cm) square. 2. Mark the exact center of the square. FOR STUDENTS: The easiest way to find the center – with a pencil draw two lines from opposite corners. Where the lines intersect is the exact center. 3. On the second piece of cardboard or poster board with a drawing compass make a circle 12 inches (30 cm) in diameter. Cut out the circle. 4. Mark the exact center of the circle. 5. Divide the outside rim of the circle into twenty-four equal parts. Discussion question: Our watches have just 12 hours, a world clock as 24 hours on it –Why? 6. Three ways to mark the twenty-four hours on the world clock. a. Using a full-circle protractor. Position the point in the exact center of the circle. Starting at 0 (which is the top), place a mark at the following degrees: 0, 15, 30, 45, 60, 75, 90, 105, 120, 135, 150, 165, 180, 195, 210, 225, 240, 255, 270, 285, 300, 315, 330, 345.
b. Using a half-circle protractor. Position the point in the exact center of the circle. Place a mark at the following degrees: 0, 15, 30, 45, 60, 75, 90, 105, 120, 135, 150, 165. Move the protractor and mark the same degrees on the second half of the circle. c. Using a ruler. Place the ruler 1 9/16 (4 cm) from the rim, place a mark where on both intersections of the rim. Move the ruler to that mark. Measure 1 9/16 (4 cm) from the original mark. Continue moving and marking. When completed you should have exactly twenty-four marks. 7. After you have twenty-four marks.Write the hours above each mark. Twelve noon is the top and twelve midnight is the bottom. 8. Divide your clock in half (6 am to 6 pm). The bottom half will be night while the top is daytime. 9. Fasten the circle (the clock) to the square (the base) with the two prong fastener. The clock should move easily. Make sure twelve noon is at the top. RESEARCH Option: have the students pick five places from around the world they are interested and figure out where they would be on the world clock. 10. Optional: Draw pictures around the square to show something about the places or paste pictures from magazines. 1. When you are having breakfast what would someone in London be eating? 2. At the time you are in school, what are the kids in China and India doing? 3. Why would it be different times in different places? How does the Earth’s rotation affect the times?